A pair of news co-anchors in Bangor, Maine, resigned on the air Tuesday, later saying station management had interfered with their journalism. 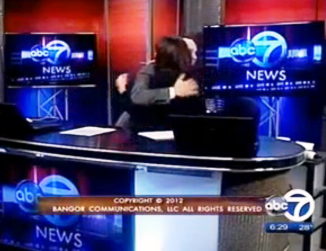 Cindy Michaels and Tony Consiglio announced that they were quitting at the end of the 6 p.m. newscast on WVII, an ABC affiliate that serves much of the nation's most rural state. "Prior to the statement, they had not told anyone else of their plans," CBS News reports. 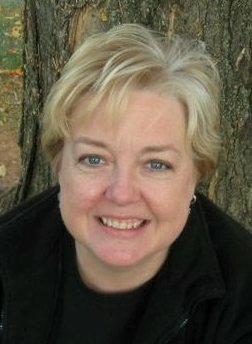 "Their boss said Wednesday they had been on their way out the door anyway. . . . On the newscast, the two didn't give specific reasons on the air for their sudden departure," but Consiglio said, "Some recent developments have come to our attention, though, and departing together is the best alternative we can take." Michaels, who was news director, told Andrew Neff of the Bangor Daily News that resigning while on the air assured them of the ability say goodbye to their viewers. "Both Michaels, 46, and Consiglio, 28, said frustration over the way they were allowed or told to do their jobs — something that has been steadily mounting for the last four years — became too much for them," Neff reports. Palmer told Neff upper management "is not involved in daily production of the news." But Michaels told Neff, "We were expected to do somewhat unbalanced news, politically, in general." She and Consiglio wouldn't say what sort of slant Palmer wanted, but in 2006, The New York Times reported that Palmer had prohibited another Bangor station he manages from doing stories on global warming, CBS noted. That is WFVX, a Fox affiliate. The stations are owned by Rockfleet Broadcasting, which also owns WJFW in Rhinelander and Wausau, Wis. The Daily News story and video of the resignation are here. UPDATE, Nov. 26: Brian Stetler of The New York Times gives more behind-the-scenes information in a story. UPDATE, July 22, 2013: Jim Romensko reports on where they are now. About 37,000 wild horses roam parts of 10 Western states. That is 10,000 more horses than the land can support, according to the Bureau of Land Management. They have no natural predators anymore, leaving them to "outstrip population goals designed to protect the range," Philipps writes. 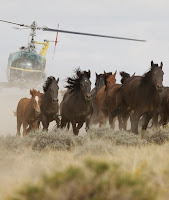 Slaughter and hunting aren't viable options because mention of slaughter creates public outrage, so the BLM regularly removes thousands of wild horses through helicopter roundups. Horses that aren't adopted are placed in "holding systems," which is a network of government feedlots and private pastures. The horses remain there until other plans can be made. More mustangs live in government custody today than in the wild, Philipps reports. The BLM spends 7 percent of its budget, or $76 million, controlling wild horses -- three times what it spends to protect the 211 endangered species on its land -- and is also running out of room to hold horses. Ranchers, hunters and some environmentalists are frustrated with the agency's management because it isn't controlling numbers at a fast enough pace, Philipps reports. 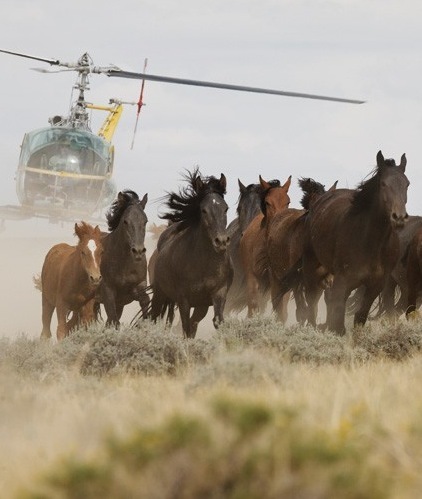 But wild-horse advocates feel the law isn't adequately protecting the animals. Meanwhile, horse lovers across the West are arming themselves with dart guns loaded with drugs that make mares infertile for up to a year, hoping to "end the need for both roundups and the holding system by reining in the population at the source," an idea that is slowly gaining BLM support, Philipps writes. High Country News is available by subscription, but a 30-day free trial can be accessed here. We're not sure if Small Business Saturday, coming up this weekend, is all that rural a phenomenon, but it needs to be. Way too many small-town businesses have closed because customers flocked to the nearest Wal-Mart or other big-box store, looking for the cheapest price, and also spent time shopping at the businesses that pop up around such stores. Many of those are small businesses, but what we like to see is busy traffic (pedestrian and vehicular) in the business districts of small towns, so Small Business Saturday should be an aid for them. The observance "was started as a reaction to the excesses of Black Friday, which almost entirely benefit major chain retailers. It is promoted most visibly by large corporations that have many small businesses as customers, including American Express, FedEx and ClearChannel this year," reports Small Biz Survival, which bills itself as "The rural and small town business resource." We might add that such companies are also sponsoring the day in an effort to get more trade from small stores. A group of Iowa scientists is warning that extreme weather events, like this summer's oppressive drought, will become more frequent as global temperatures continue to rise, Ken Anderson of Brownfield Ag News reports. The group released an updated "Iowa Climate Statement," in which lead author David Courard-Hauri of Drake University wrote there will be an increase of "extreme wet and dry events" in Iowa as pollution continues to rise, which will directly impact crops. "Weather varies too much and has too many drivers to attribute any particular event to a single cause like climate change," Courad-Hauri wrote. "But there is a clear pattern of crop loss and property damage from increasingly frequent events like flooding, drought and dangerous storms." Iowa State University climate scientist Christopher Anderson says higher frequency of wet springs in the state is another indicator of extreme weather caused by climate change. 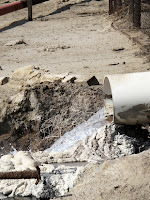 Iowa farms are already in the hot seat for high amounts of nutrient runoff into streans. State Agriculture Secretary Bill Northey revealed a new nutrient-reduction strategy this week that he said will produce better results than previous efforts, Anderson reports. Northey said he will increase efforts to persuade farmers to adopt different fertilizer application rates, timing and methods; and edge-of-field practices. The plan has support from the Iowa Soybean Association. Millions of rural Americans are still without high-speed broadband Internet access, even after large telecommunication companies promised to extend the service into rural homes in their coverage area after buying regional telecommunication companies. Consumer advocates say companies "have pocketed the profits from those deals while regulators have failed to enforce their obligations," reports Gerry Smith of The Huffington Post, formerly of the Chicago Tribune. About 19 million people still lack high-speed Internet access, and most live in sparsely populated rural areas. AT&T merged with BellSouth in 2006 in an $86 billion deal that gave the company customers in 22 states. It stuck a deal with the Federal Communications Commission to extend broadband to "all residents in its combined territory," with at least 30 percent of wired Internet deployment, or DSL, in rural or low-income communities, Smith reports. AT&T says it has met those obligations, but it refused to tell Smith where services were extended. Advocacy groups say the FCC doesn't hold companies accountable for defaulting on their extended-broadband promises, but an agency spokesman told Smith the FCC "has and will continue to take action to enforce these merger commitments," and that the FCC believed AT&T had followed through based on a letter the company sent to the agency. The FCC depends on companies to self-report compliance with merger conditions, and doesn't conduct its own audits. Some former FCC commissioners and industry experts say merger conditions often have loopholes that allow companies to comply without fully extending broadband to rural areas. The lobby for makers of over-the-counter drugs, which has fought laws to tighten controls on sale of cold medicine that is used to make methamphetamine, is starting a public-education campaign to discourage evasion of the system that tracks purchases of pseudoephedrine. 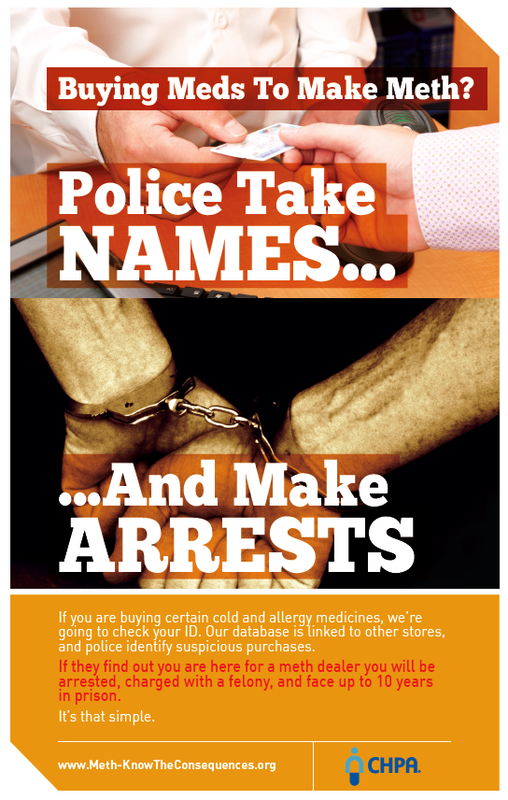 The targeted states are Kentucky and Alabama, which could be key to preventing passage of laws like the one in Mississippi, which requires a prescription for pseudoephedrine. The Consumer Products Healthcare Association rolled out the campaign in Alabama last month. It joined with the Kentucky Pharmacists Association and the Kentucky Retail Federation yesterday to announce the program in Kentucky, and won the blessing of its primary adversary in the state's legislative battle, Senate Republican Leader Robert Stivers of Manchester. Stivers, who is in line to become Senate president, was asked if the drug makers' move signaled a truce in the battle. He indicated that he would wait to see the impact of this year's law, which reduced the amount of pseudoephedrine that can be bought during one a month, before trying to tighten it. "Let's look at the history and see what happens," he said. Earlier, he said: "I appreciate the fact that they're coming here in a very conciliatory way, a very open way, to say we all know there is a problem." Democratic Gov. Steve Beshear said the success of the law depends on educating the public: "As laws are passed, criminals adapt and find new ways of getting around them." 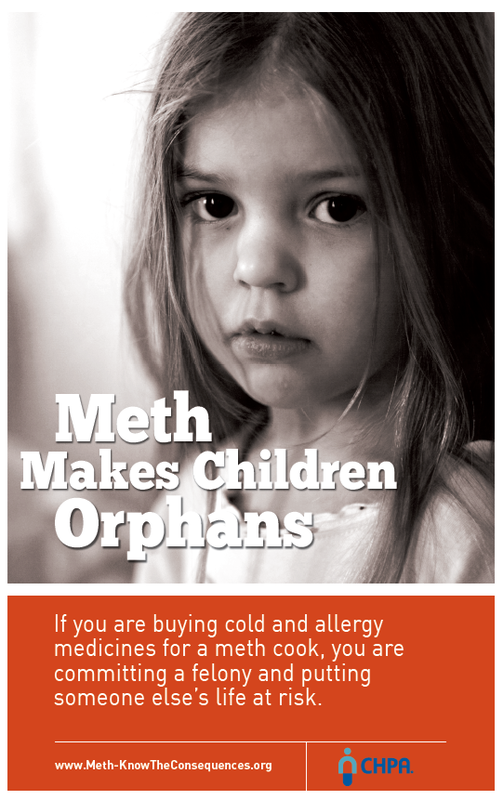 Preventing that is the goal of CHPA's "Anti-Smurfing Campaign," named for the practice of meth makers using others, "smurfs," to buy pseudoephedrine for them. Beshear noted that the new law makes smurfing a felony, and said the posters are "designed to make smurfers think twice" and "think of the moral and criminal consequences of their actions." He told cn|2 Politics, "I think will be a good deterrent in this situation." The industry wants the rule changed, and put $1 million into the 2010 campaign of Gov. Susana Martinez, who vowed to roll it back. She appointed two of three members to the state's Oil Conservation Commission, which is meeting to make changes to the rule. Environmentalists and ranchers are fighting to keep the pit rule in place, saying that water and soil will be contaminated without it. But, it's a fight they expect to lose, Soraghan reports. 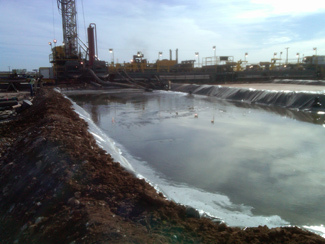 The loophole was created in the 1970s, when the EPA was banning oil companies from dumping wastewater. Ranchers complained their livestock needed it to drink, and still dismiss concerns about its safety. And even though states can regulate wastewater, regulation on Indian reservations is done by the EPA on a case-by-case basis. Oil and gas companies dump freely on the Wind River Reservation in Wyoming, "so much that is creates streams that flow into natural creeks and rivers," Shogren reports. Wastewater often contains toxic chemicals, including carcinogens and radioactive material. Through a review of EPA documents and emails obtained through a Freedom of Information Act request, Shogren found that some EPA staffers "clearly are appalled by wastewater releases," with one even saying that it could have "irrevocable human health and environmental impacts." The documents "suggest that as least some people inside the EPA are advocating for stricter rules," Shogren writes. "But much of this debate has been kept secret." Coal prices and production are down in the Eastern U.S. because of cheaper natural gas, increased pollution controls and geologic issues. 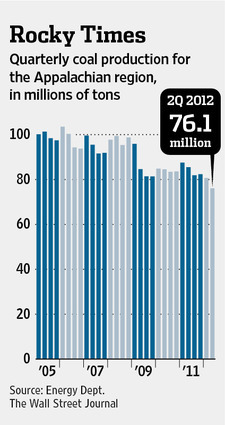 The price of Eastern coal is down 30 percent, and production in Appalachia is down 9 percent. Several coal companies are auctioning off large earth-moving equipment to "generate cash and avoid maintenance" costs, Kris Maher of The Wall Street Journal reports. 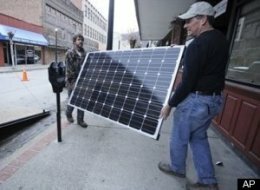 The Jobs Project, an organization trying to bring renewable-energy jobs to Kentucky and West Virginia, is working with solar energy company Mountain View Solar & Wind of Berkeley Springs, W.Va., to create a jobs-training program. Solar panels are assembled and installed by unemployed or underemployed coal miners. Jobs Project spokesman Nick Getzen told Smith some people were "skeptical" when the idea was first brought up about a year ago because nearly all the region's electricity comes from coal. "Revolutionary telehealth approaches across the United States are helping senior citizens continue to live independently in their own homes," Candi Helseth of the Rural Assistance Center. Those approaches include a research project that uses telehealth and motion sensors to track and report residents' daily vital signs; integration of telehealth and home nursing care; and management of chronic diseases from home. The LivingWell@Home program is a five-year Good Samaritan Society telehealth research project being conducted in 40 communities in the Dakotas, Minnesota, Iowa and Nebraska. Participants in the program wear personal emergency response systems that "automatically summon help if they are unable to do so," Helseth writes. The system also directs participants through vital sings checks, and motions sensors installed in homes monitor movement and sleep quality 24 hours a day. Data is sent to Good Samaritan's headquaters in Sioux Falls, S.D., where it's analyzed by nurses who report it to designated care providers. Guckian and Sorrio discovered several reasons for the stark disparities. Mostly it's all about money and location. 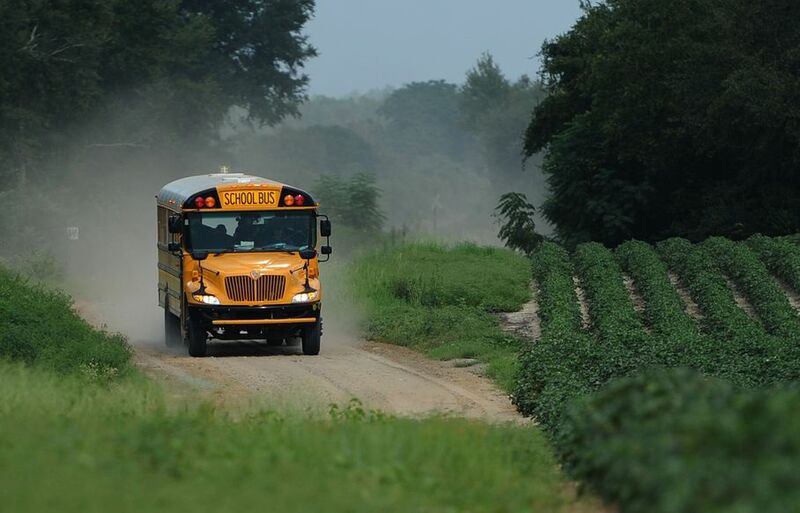 Only 5 percent of rural students take advanced placement exams, compared to more than 20 percent in suburbs; rural districts spend about $400 less than other per student; and rural teachers don't have as many opportunities for training and development. Rural superintendents told Guckian and Sorrio that more money doesn't necessarily mean students will be successful, but they can't afford educational extras that are standard at suburban schools, giving their students a systemic disadvantage. Also, Georgia has more counties (159) than any state but Texas, and each has at least one school district, for a total of 198. UPDATE, Nov. 23: In another installment of the series, the AJC illustrates the disparity in preparation of students in suburbs and rural areas, starting with the story of a rural valedictorian struggling to stay in a low-level college. This would "have enormous consequences," Myers writes. "Of the hospitals that lose CAH designation probably most will close or merge with another hospital. I've seen no estimates of numbers. There are more than a few congressional budget hawks in both parties who would like to eliminate the special payments to Critical Access Hospitals entirely. If these small hospitals dodge the bullet during the lame duck session, they'll continue to be targets in the next Congress. If they are successful in reducing payments to CAHs, the net effect will be to move health care capacity and jobs from smaller to larger towns." Children who attend day care regularly are 50 percent more likely to be overweight than those who stay home with parents, according to a new University of Montreal study in Quebec. Lead researcher Marie-Claude Geoffroy said the disparity "cannot be explained by known risk factors such as socioeconomic status of the parents, breastfeeding, body mass index of the mother, or employment status of the mother." Researchers studied more than 1,600 families with children born in 1997 and 1998 in Quebec, a sample that was representative of the majority of kids in the province. Mothers were interviewed about their children's care at ages 1.5, 2.5, 3.5 and 4. Children were put into groups based on the type of care they received most. Researchers concluded that 65 percent of children spent most of their time in day care. Just 19 percent were cared for mostly by a parent. But Guerin writes there are a lot of other theories for the sudden price drop. 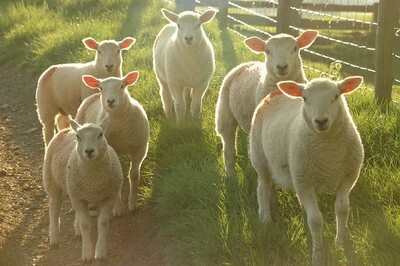 Increasing amounts of African and Middle Eastern immigrants who favor lamb meat caused prices to soar for almost a decade. Last year's record-high prices have likely created this year's bust because prices eventually got too expensive for consumers, Guerin writes. Consolidation of meatpacking companies had a big impact, too. There are only a few major lamb packers in the U.S., and one company's decision to reduce buying can have a major impact on prices. Greater imports of cheaper lamb from New Zealand and Australia, which now account for almost half the lamb on the U.S. market, also hit ranchers hard. The state-by-state presidential election map showing a mostly Republican South obscures clearer divides among the electorate: racial and rural-urban, Karen Cox, a history professor at the University of North Carolina-Charlotte, writes in The New York Times. The author of Dreaming of Dixie: How the South Was Created in American Popular Culture writes that the "Republican Party has become the bastion of white voters, and not just within the South." But her focus is on rural vs. urban, and on reminding the rest of the country that the South has plenty of liberals like her. But her analysis can only be taken so far, say the political experts at NBC News. Citing Obama's big margins in Southern cities, and Romney's in rural counties, Cox writes, "They are part of the same urban-rural divide that drives voting everywhere. . . . The same urban-rural divide can also be found in blue states like California and Washington." Romney won 59 percent of the vote in rural counties and 61 percent in exurban counties, which are in metropolitan areas but remain largely rural, according to the Daily Yonder. Looking to the Republican West, she writes, "They are states with largely rural populations that tend to be less diverse racially and ethnically, and they tend to vote more for conservative Republicans — the same trend found in the rural counties of the bluest of states. . . . In other words, before our liberal allies in blue states point their fingers and scoff, they might want to take a look in their own rural backyards for evidence that their states actually have something in common with the supposedly backward ones in the South." Cox concludes, "If the Democrats are going to be a true majority party, they will need to build a coalition in all 50 states. So rather than see the South as a lost cause (pun intended), the Democratic Party and liberals north and west of us should put a lid on their regional biases and encourage the change that is possible here."